This is a follow-up for the previous blog post on the importance of small plein air landscape in terms of color training. 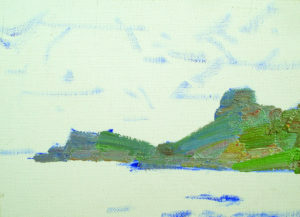 Below is the process and approach I take for small plein air landscape painting. 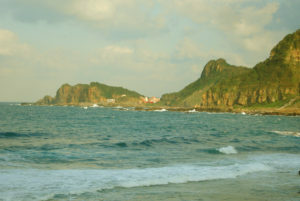 A photo of Taiwan’s northeast coast taken around mid-October in 2007. It was around 3:30 in the afternoon with some sunlight and light cloud cover. 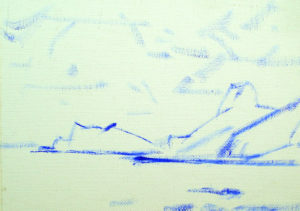 For quick plein-air oil paintings I like to use Ultramarine for the initial sketch. The color melds in well with other colors so it doesn’t disrupt the depth of the composition even if some of it comes through at the end. For the block-in, I often use a paintbrush with springy yet slightly stiff bristles. Here all I do is get the horizon, coastline and mountains’ general outlines down on the canvas. I also make a note of their spatial relationship. “Laying” means to spread out evenly. Painting is about shapes and colors. So here I am “laying” and “painting” at the same time. In other words, I am paying attention to the hills’ spread and consistency while balancing the foreground and background. Around 70~80% of all work on shapes and colors are done at this stage. A hog bristle brush of medium width well soaked with paint was used here. I painted the far distance first, followed by the middle, then the front. Bold strokes were used to lay down the colors without worrying about the details. I began with the more blue parts of the sky, paying careful attention to their brightness relative to the water. Here I “swing” upwards from the bottom of the sky. By “swinging” and adjusting the mix of colors as I went, this created a difference in depth between the top and the bottom. I don’t just paint across the sky with one particular color. For the sky, I usually use a larger hog bristle brush. If I will be using a lot of paint, I mix up the gray tones for all of the different colors on the palette first. This gives me plenty of “ammunition” when I do finally put brush to canvas. Allow yourself some time for finishing up the painting at the end. Here I scraped away the clouds on top of the mountain and adjusted the shape of the waves. Too much detail ruins a mini-landscape so only the necessary highlights should be included. Here we have the houses on the hillside, the shadow of the cliff, the breakwater as well as the waves in the distance and up close. Here I used the word “embellish” because I want to emphasize the fact that details in mini-landscapes shouldn’t be “rigid”. Simply “hint” at it like in Chinese landscape paintings. This gives the details energy and interest. The brushwork is also important. 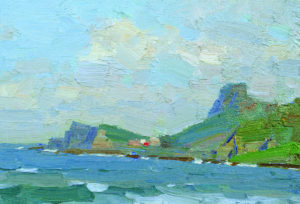 If you “search” for just the right color every time before “applying” your brush to canvas, the brushwork itself helps to create the “details of the composition”. 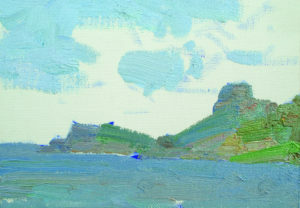 For information about plein air landscape video lessons, please click here. 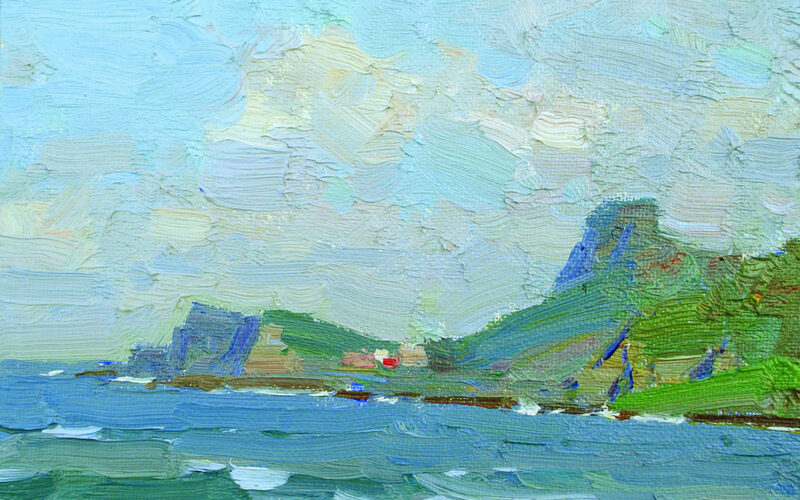 For information about plein air landscape painting books, please click here. This is helpful stuff, especially the high resolution images. I can really see all the brush strokes in detail.